Loyalsock State Forest in Sullivan County is home to many beautiful natural features including many great waterfalls. Some of these, like Dry Run Falls and Cottonwood Falls, are well-known. Others, are located far from the road on trails or even located off of the main trails. There are four waterfalls along Ketchum Run in Ketchum Run Gorge. 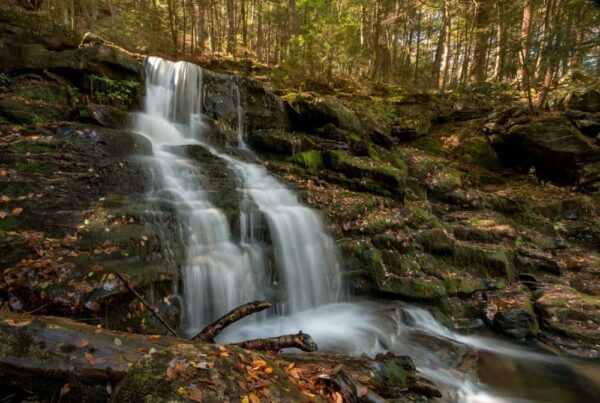 One of these waterfalls is along the Loyalsock Trail, which meanders for a short distance along the creek. Another is just off the trail, but is easy to miss. The other two, however, are off the main trail and only seen by those that know where to look. Rode Falls is a highlight of Ketchum Run Gorge. 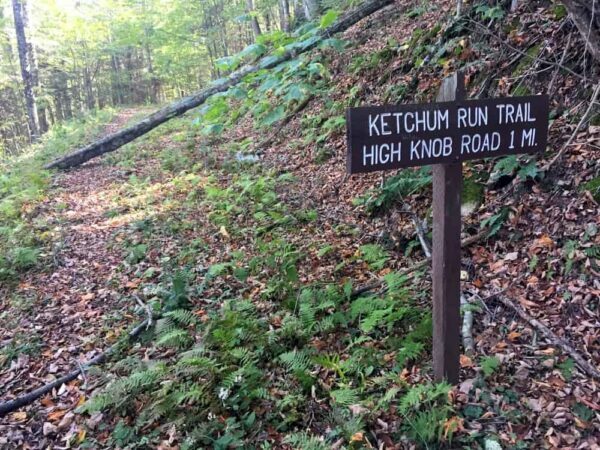 The Ketchum Run Trail is a lightly trafficked trail that starts behind a gate on High Knob Road. The trail is wide and easy to follow as it meanders its way through the woods. Several trails come off from the side, but continue following the yellow and blue blazes. After approximately seven-tenths of a mile, the trail will dead end. To your left, there is a small bridge over Ketchum Run. Don’t cross this bridge. Instead, continue following Ketchum Run off trail. The Ketchum Run Trail is blazed with both blue and yellow markers. This off-trail section is relatively easy as there is little undergrowth along the banks of Ketchum Run (though the first few yards are a bit overgrown). While there’s no trail, simply follow the creek for the next three-tenths of a mile making sure to stay on the right bank. After a short distance, you’ll come to the uppermost falls on Ketchum Run. This unnamed drop is approximately seven feet in height and features a narrow channel of water dropping between two rocks. 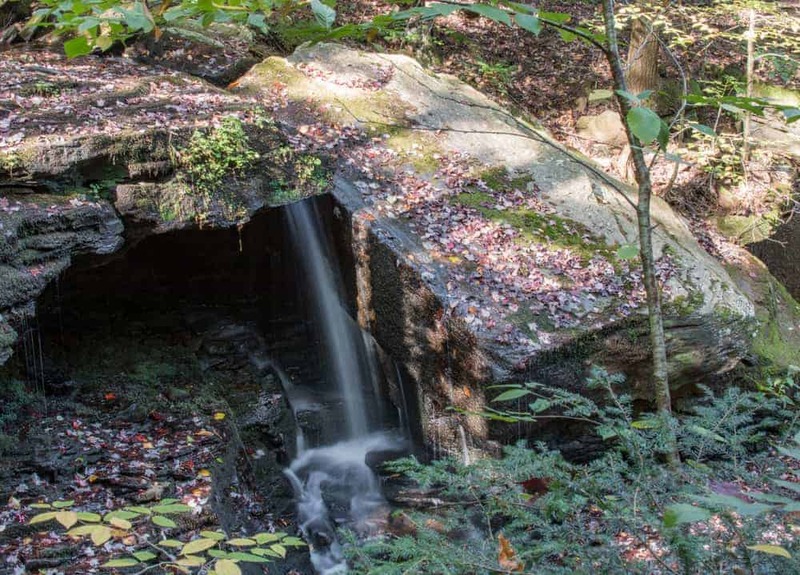 While an interesting formation, this is both the smallest and least photogenic waterfall on Ketchum Run. The uppermost waterfall on Ketchum Run. Continue following the stream downhill for a short distance until you reach what I’ve dubbed Ketchum Run Falls (though I don’t believe it has an official name). It is located at approximately these coordinates: 41.447831, -76.620685. This 20-foot waterfall is hidden just a few yards from the Loyalsock Trail, but few know that it’s here. It can be seen from above, but the view from the bottom of the falls is the most impressive. The 20-foot Ketchum Falls might have been my favorite of the four waterfalls in the gorge. After you’ve had a chance to soak in the beauty here, continue downstream. After a few steps, the Loyalsock Trail will come in from your left and continue downstream on the same side you’ve been hiking down. 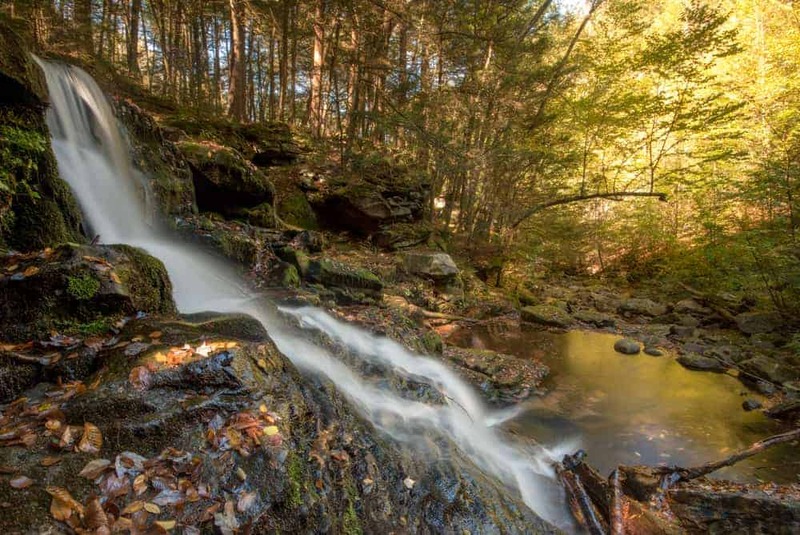 Follow the Loyalsock Trail has it meanders down Ketchum Run, past several scenic campsites. After 5-10 minutes of hiking, the trail will seem to dead end as the Loyalsock Trail makes an abrupt right turn up a steep hill and away from the creek. At this point, you’ll likely be able to hear, but not see, Lee Falls. To see it, carefully pick your way down the hillside along Ketchum Run. 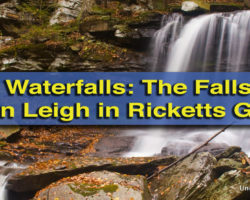 The waterfall is mere steps off of the Loyalsock, but can’t be seen well from the trail. 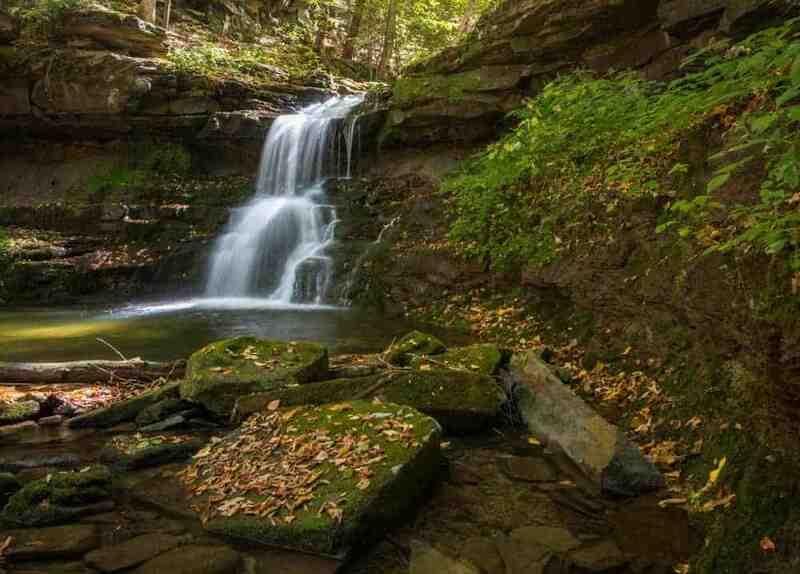 Lee Falls is located steps off of the Loyalsock Trail. The descent to the base of the falls here is challenging and should only be attempted by those experienced in this type of hiking. Lee Falls is an impressive 15 foot falls. The fact that it’s so close to the trail, but so easy to miss makes this another special waterfall to visit. 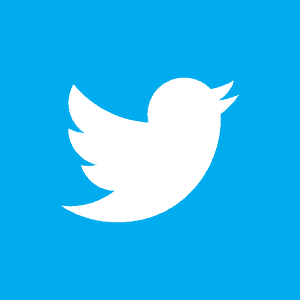 It is located at roughly these coordinates: 41.451431, -76.627691. From here, you have two choices. A side view of Lee Falls looking downstream. 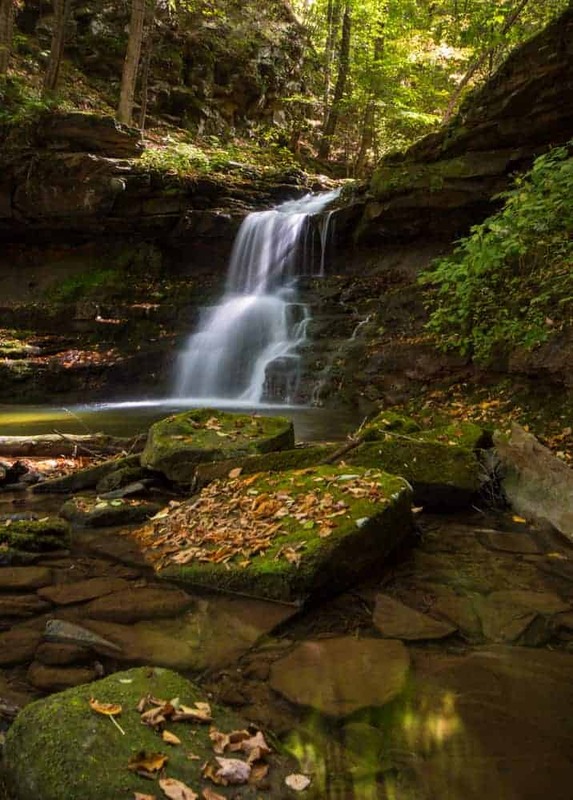 Some sources indicate that an old trail, known as RX-4, once traveled along Ketchum Run between here and the Loyalsock Trail, roughly half a mile further downstream. While this may be true, I came across almost no remnants of this trail. 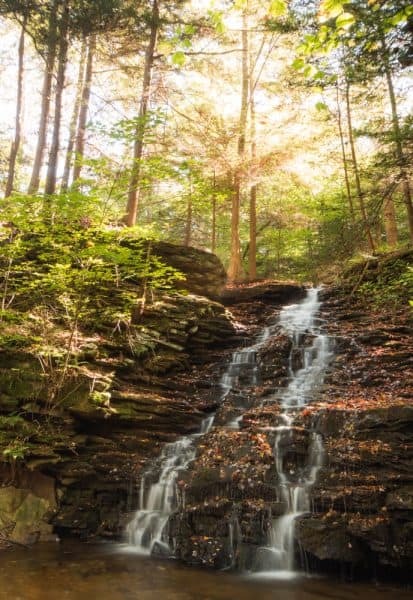 However, if you are looking for an adventure and water levels are relatively low, you can carefully hike down Ketchum Run until it once again intersects with the Loyalsock Trail. I opted to do this during my first visit, but would not choose this way again. Instead, my recommendation is to climb back to the top of Lee Falls, and follow the Loyalsock Trail uphill. The uphill section here is short, but quite steep. Eventually, it reaches the top of the hill and travels along the ridgeline for about half a mile. Eventually, you’ll reach a sign that indicates a choice. You can follow the Loyalsock Trail downhill towards Rode Falls, or you can take the detour on the RX-5 trail. This split shows the way for those wanting to avoid the ladder at Rode Falls. To get from the top to the bottom of Rode Falls, you will have to climb down a sturdy wooden ladder. 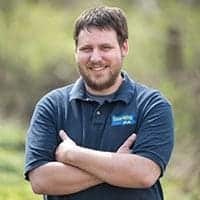 If you, or members of your party (such as dogs), are not able to do this, take the detour, and then double back to Rode Falls when you reach the Loyalsock. 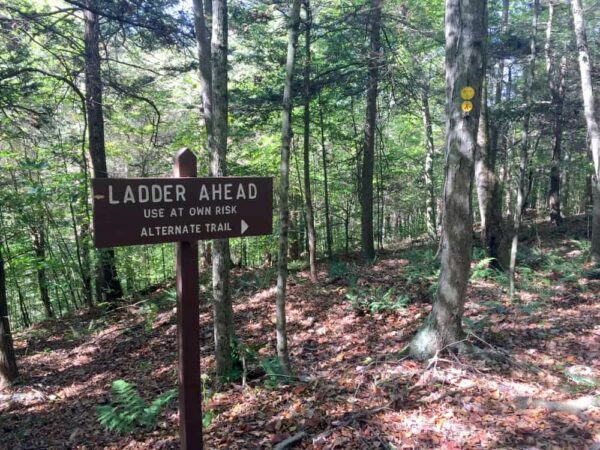 If you are capable of handling the ladder, continue following the Loyalsock Trail back downhill towards Ketchum Run. Once at the bottom of the hill, you soon reach the ladder and Rode Falls. Rode Falls isn’t overly large, maybe only 12 feet in height, but it has carved itself an impressive horseshoe-shaped hollow. 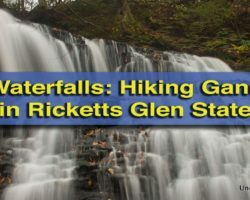 The rock walls are so sheer that a short ladder is required to assist hikers in reaching the base of the falls and continuing on the Loyalsock Trail. Rode Falls can be found at approximately these coordinates: 41.455964, -76.634321. Rode Falls is the final waterfall on Ketchum Run. While a variety of hiking options exist for longer hikes, Rode Falls makes the perfect endpoint for hikers wanting to see the waterfalls of Ketchum Run Gorge. Take a few minutes to enjoy the beauty of this area before starting to retrace your steps. Most of the hike follows the same paths that you hiked through the gorge. 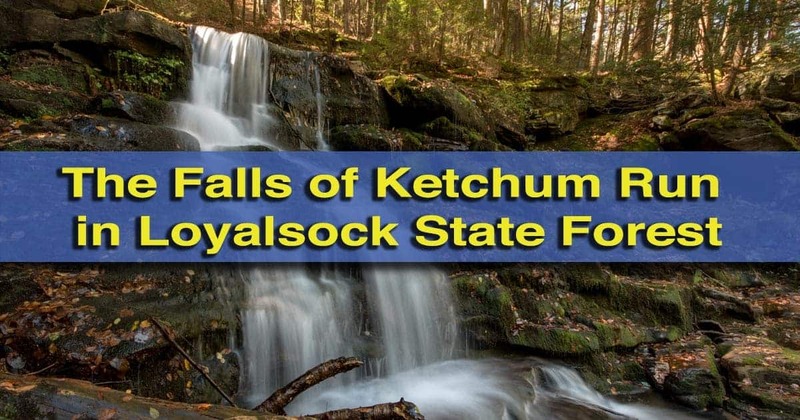 However, when the Loyalsock Trail crosses Ketchum Run just below Ketchum Falls, you have a choice. The first is to continue up Ketchum Run using with the same off-trail path that you used on the way in. The second is for those looking to extend the hike a bit. 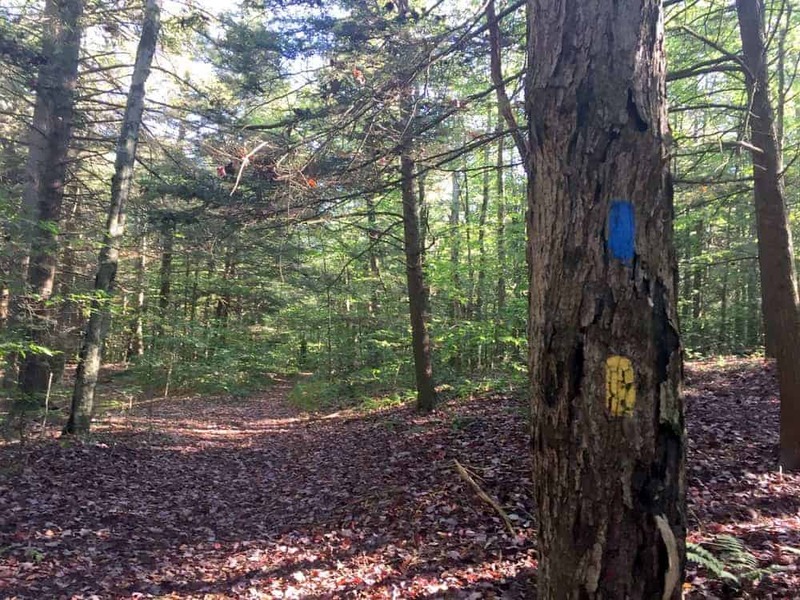 For this option, follow the Loyalsock Trail over Ketchum Run and continue hiking it for 10-15 minutes until the Ketchum Run Trail comes into view on your left. The trail here is a former road that has become somewhat overgrown. Follow this path for roughly a half mile until it emerges next to Ketchum Run at the point where you started your off-trail hike. There is a sign indicating where to turn onto the Ketchum Run Trail. To return to your car, cross Ketchum Run on the bridge and turn right on the Ketchum Run Trail to head upstream for the 10-15 minute walk to your car. 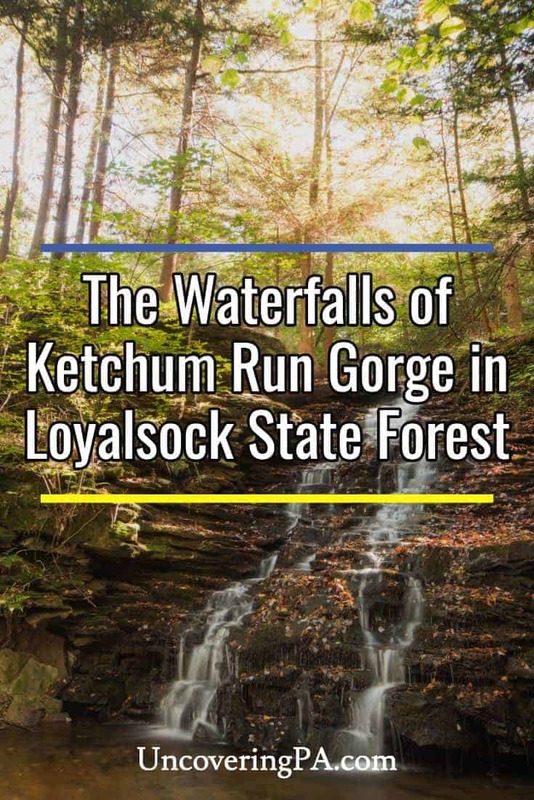 Overall, the Ketchum Run Gorge is one of the most beautiful spots in Loyalsock State Forest, and offers the chance to see four beautiful waterfalls on a somewhat long, but not horribly difficult hike. 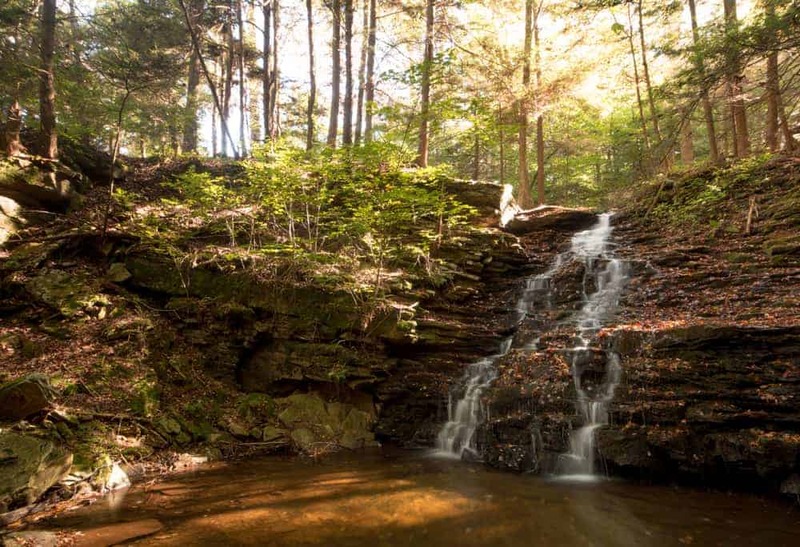 This is definitely a hike that you don’t want to miss if you are looking to see the best of Loyalsock State Forest in Sullivan County. Another look at Ketchum Falls. 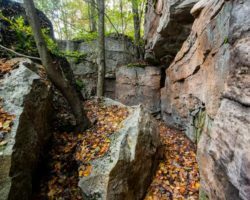 While some sources recommend parking off of Worlds End Road at the Fernrock Natural Trail, this only makes sense if you are looking to do a longer loop hike. 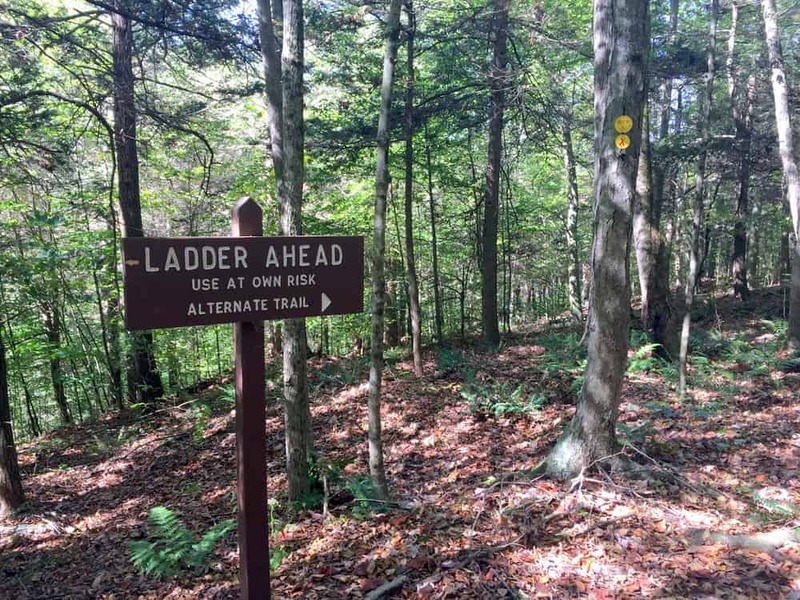 Instead, if you are just looking to do the out and back hike that’s described here, park off of High Knob Road at the first gate on your right. This gate is 1.2 miles from the intersection of High Knob Road and Worlds End Road. It can be found at the following coordinates: 41.439576, -76.625359. Park next to this gate off of High Knob Road. Do not block the gate when you park. 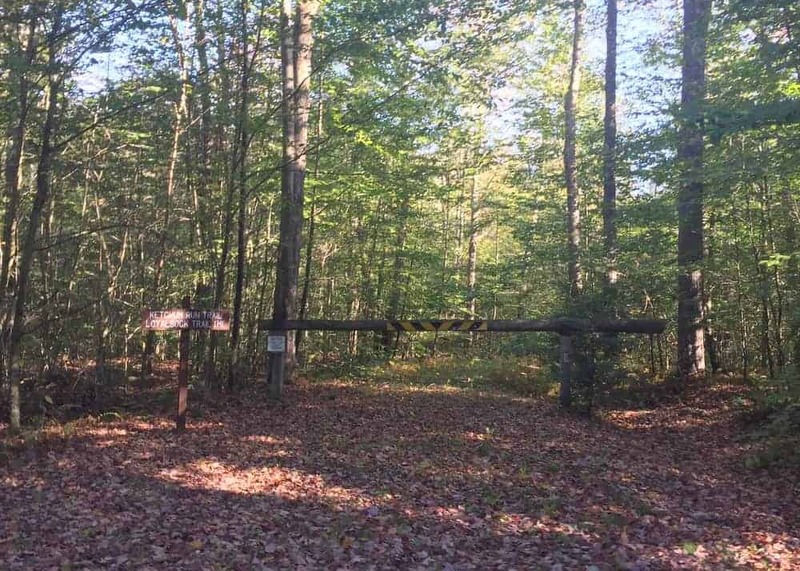 While Google Maps seems to call this the Bark Shed Trail, both the Loyalsock State Forest Map and a sign at the trailhead indicate that this is the Ketchum Run Trail. While Google Maps labels this the Bark Shed Trail, both the state forest map and a sign at the trailhead indicate that this is the Ketchum Run Trail. 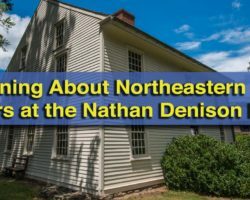 Looking for other places to visit in the area? Check out the Cold Run Trail, Dutchman Falls, Jacoby Falls, the Eagles Mere Museum, and the Eagles Mere Air and Auto Museums. 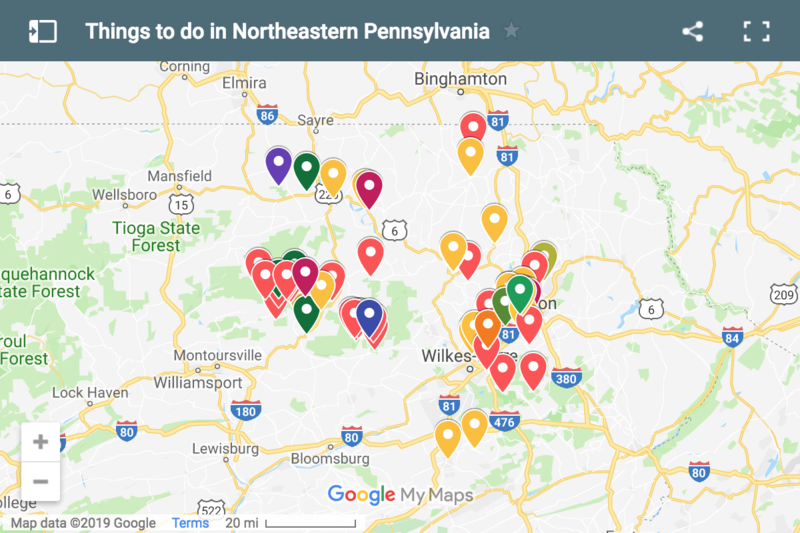 You can also check out our top things to do in Worlds End State Park.